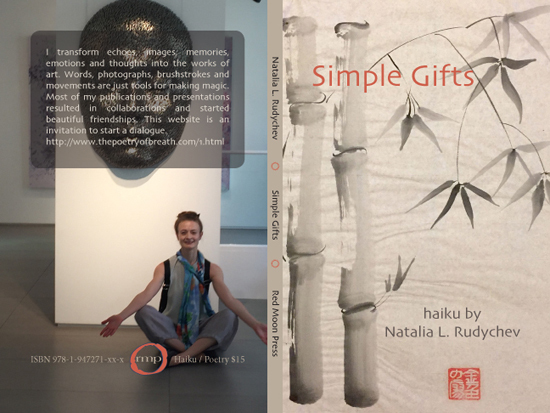 "Simple Gifts, the title of Natalia’s first haiku selection, comes directly from Joseph Brackett’s song, a hymn to be danced, written in 1848 for his Shaker community. It became widely known after Aaron Copland incorporated its melody into the ballet music for Martha Graham. Graham, the mother of modern dance,named it Appalachian Spring before staging it in October 1944 at the Library of Congress, choreographing it and dancing the lead role. Natalia says Brackett’s song embodies all of her artistic endeavors, in dance, photography, and poetry. " "Natalia Rudychev’s first collection of haiku is soft, romantic, evocative and telling. It tends toward “psychological senryu” with a strong thematic emphasis on relationship. Also evident are the author’s many practices, including her photographs serving as section dividers. A strong first statement."